Kernville is a small mountain town in the southern Sierra Nevadas. The gold rush hit the area in 1858 and soon a town popped up and went by a series of names, one of which was Whiskey Flats, after the first bar that opened in town. This town would later be re-named Kernville. The area is a beautiful reminder of how lucky we are to be able to enjoy the views and perfect riding in this area. So I must give a tip of the hat to Biltwell for throwing the Kernville Kampout at the Frandy Campground right in town. 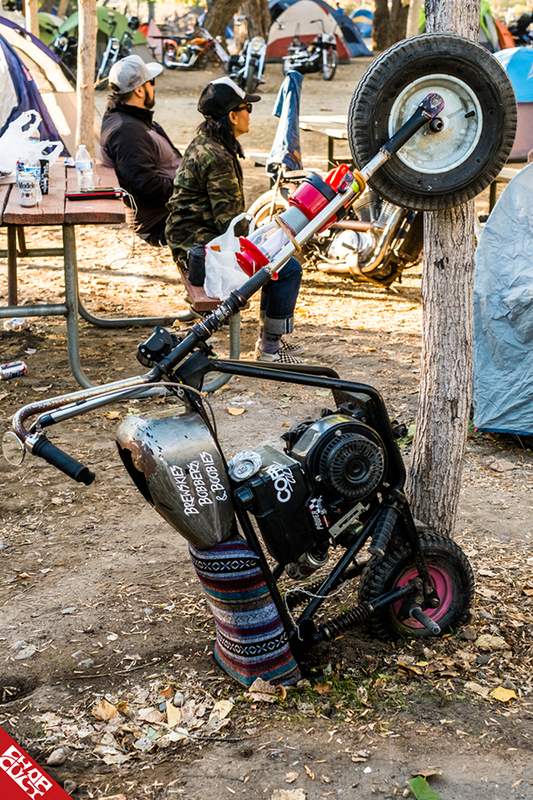 This year marked the 2nd annual Kernville Kampout and it was one for the record books. The weekend brought loads of bikes roaring into downtown Kernville to take the once-quiet town and turn it into something out of a 60's biker exploitation flick, if only for a short time. The guys at Biltwell and 805 Beer were generous enough to dish out free booze all weekend. This, coupled with having the entire campground reserved for ourselves, made for a damn good time. There were loads of great bikes littered amongst the tents and tarps, and of course, there were the show bikes lined up along the barn wall, attracting the eyes of everyone that were lucky enough to walk by. My favorite one, in particular, was a bike earning the 'Most Crashed Award'. I even got a little taste of my psychobilly days with the Guana Batz playing Saturday night. All in all, it was an excellent weekend of full of perfect riding, seeing old friends, and making new ones...and who can forget the camping?! Until next year, ride safe and have fun!